For that look of Elegance in a Specialty Vertical, try Jackson’s Privacy Sheer or Sheer Elite Verticals made here in Canada by long established manufacturers. These wonderfully versatile window coverings combine the best qualities of Sheer Draperies with Vertical Blinds. Their unique, light shaping features allow you to select a variety of effects depending on the mood you are trying to create. 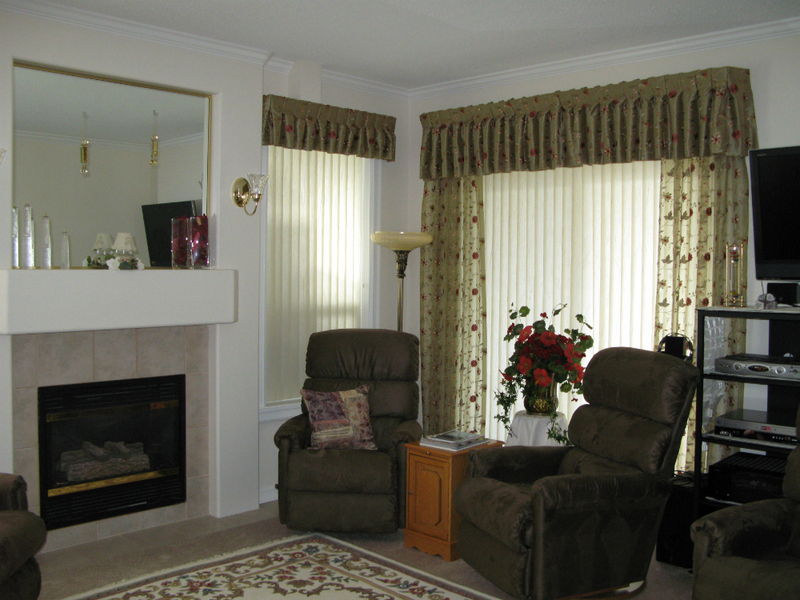 “Two treatments in One”; Vertical Blinds are wrapped with a Sheer Drapery Fabric of your choice. With the Fabric snapped in place or velcroed to the blind, you can easily remove it for washing just like a Sheer Drapery. Come in and see the beautiful displays in our showroom. Hunter Douglas Luminette is a well known vertical sheer blind that uses bonded vertical vanes. Vertical Sheers provide this living room with both Light Filtering and privacy options. Enhanced by coordinating lined Embroidered Fabric Valances in a mini box pleat style with Embroidered Sheer Drapery Side Panels, they are a perfect solution for French or Patio Doors. From a design perspective, they appear to be a lovely columned drapery but have the advantage of adjusting light flow and privacy that a vertical blind has.